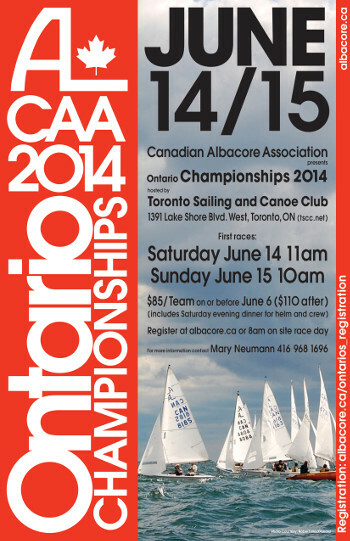 CAA Ontario Albacore Championships 2014! Presented by the Canadian Albacore Association and happening June 14 and 15, just down the lake at the Toronto Sailing and Canoe Club. Registration is $85/team on or before June 6, and $110/team dollars after. Includes Saturday evening dinner for helm and crew. Races start 11am on Saturday, 10am on Sunday. Register at albacore.ca, or on-site at 8am on race day. For more information, contact Mary Neuman (416-968-1696). Wednesday Dinner - June 11! Wind forecast looks great assuming the thunder and lightening hold off, but regardless, Bea and friends are cooking up a feast this Wednesday. The always-epic Club Crawl social arrives Saturday, May 24th. This year's crawl theme is "The Time Machine!" For all the important details, and to purchase your tix, here's the event link. Wednesday, May 21st @ 6:30, Ed Young and Jeff Gerrits will be hosting an on-land Catamaran refresher session at J-Town. The session is targeted at returning catamaran sailors (those who have already taken an intro clinic), but anyone interested in sailing catamarans is welcome to attend. We'll go over safety procedures, wind limits, launching and docking, boat handling skills, and proper rigging/sail maintenance. Please note that the first on-water introductory clinic will take place on June 8th from 9 AM to 3:30 PM. The first Harbour Masters race of the year is this coming Sunday at 1pm. The Sailing Instructions are on the Canadian Albacore Association website at albacore.ca. Note: the race committee has the option of setting a gate for Windward–Leward races (aka the Measor rule). This is a season long series that runs on 8 Sundays. First race is at 1pm, second race follows first race (2 races per day). Check the calender for specific dates. You enter as a boat for each race (i.e. you enter with another person for a given race but can change from one race to the next). There is a sign up on the board at the clubhouse. Please have both helm/crew/boat listed. For more information on sign up, contact race@sailtoronto.com. The Friday Night Race Series (FNR) kicks off on May 2nd. We are the host club so it is important that all the racers show up. When: May 2nd - That's next week! What: FNRs are a weekly race series that runs all year. It is a lot of fun. Each week you register as helm or crew. On the Wednesday, a draw is done to determine who you are sailing with. There are prizes (coveted mugs) for finishing in the top 5 club boats and year long results for individuals and clubs. It is a great way to meet and sail with all the sailors at JTown and other clubs. We have won the club award 2 years running. Let's make it 3! You can sign up on the club website (up to the Wednesday before, 9pm). Go to http://sailtoronto.com/racing/. On the right side, there is a list of upcoming races. At the moment the next 3 FNR races are listed as well the Icebreaker and the first Harbour Masters. Click on "Friday Night Race - May 2" and it will bring you to Friday Night Race - May 2. On Thursday, check your email or http://sailtoronto.com/racing/FNRDraw for the draw results. You can also sign up at the club (between the front door and chalkboard, there is a clipboard with FNR on it). Do this by the Monday before the race. All else fails, call/text (647-273-2845) or email the race chair at race@sailtoronto.com. Other questions/concerns? Email Andrew (race@sailtoronto.com). The May Learn-to-Sail program kicks-off next week with first on-the-water “sail with Old-Salts” classes. Weather permitting, we need old-salts to take our brave new May class sailors for what will hopefully be an enjoyable first sail. For the weekday class, the first session is Tuesday, April 29, 6-9pm, and second session is Thursday, May 1, 6-9pm. For the weekend class, the session is Saturday, May 3, 9am-4pm. If you're available, please email Greg Brothers (education@sailtoronto.com) and show up at the club 30 minutes before the classes start. I’m looking at the weather forecasts and it is not looking so good for the CANsail 1&2 first old-salt class so I am making the call now to post-pone the on-water class until Thursday. Thanks for volunteering but we absolutely will NOT need you to old-salt tonight. Everything will push out one lesson so the Old-salt classes for the weekday class will now be: Thursday May 1st and Tuesday May 6th. I will update the old-salt sign-up sheet right now if you are interested in signing up for the class next Tuesday. In lieu of the on-water class we will have an on-land session. Chris has offered to talk a bit about weather and we can cover some sail theory. If it is not pouring rain we can go over rigging again. Our 2014 new member recruitment is well underway, but we need your help! J-Town will be hosting open houses every Saturday and Sunday from noon-2pm and 2pm-4pm, starting April 5th and running until the end of May. We need friendly volunteers to greet our prospective new members, show them around the club, and answer any questions. It's super easy and a fun way to spend an afternoon at the club! Each day has two 2 hour time slots available. Just follow the directions on the Wiki link below to sign up. If you have any questions I can be reached at membership@sailtoronto.com. Docks-In is just around the corner... April 12th now that we pushed the date a week to contend with the slow spring thaw! In order to prepare, we need to flip the docks over for barrel repairs. Since we seem to have critical mass, we're meeting March 30th! If you can help, be at the club on March 30th at noon. We need as many people to help as we can get out!